Visited the Greek Sculptures exhibition at the National Museum recently. Truly artistic and a wonderful experience to look through the exhibits. What struck me most was the corner in which the busts of Socrates, Plato and Aristotle sat, seemingly mundane compared to the grandeur of the Aphrodites and Athenas (see more exhibition photos here). Isaac Newton once said, “If I have seen farther than others, it is by standing on the shoulders of giants.” These three were pretty much the original Giants – widely recognized as the founders of Western philosophy and scientific thought. 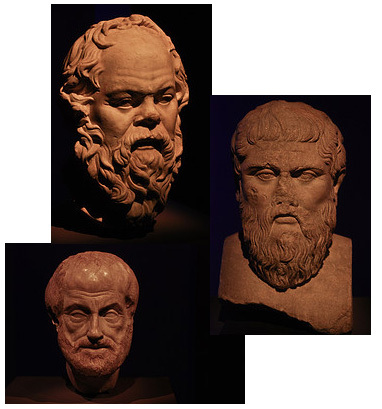 Among their many contributions – the Socratic method was the precursor to the scientific method which is practiced to this day. Plato founded the first institution of higher learning in the western world, and Aristotle wrote about a mind-boggling range of subjects; including formalisms of logic that would reign till well into the 19th century. It would be hard to find a legacy greater than theirs. This was written by Anshul. Posted on Sunday, February 10, 2008, at 10:55 pm. Filed under art, science. Bookmark the permalink. Follow comments here with the RSS feed. Post a comment or leave a trackback. DOL -> Je te remercis d’Ãªtre d’accord avec moi, mais je pense que tu as du confondre mon post avec celui qui suivait postÃ© par un « catholique de ga0ueh »&#823c; a moins que tu souhaitais toi aussi remercier Martin Vidberg de nous amuser avec ses dessins tous les jours.